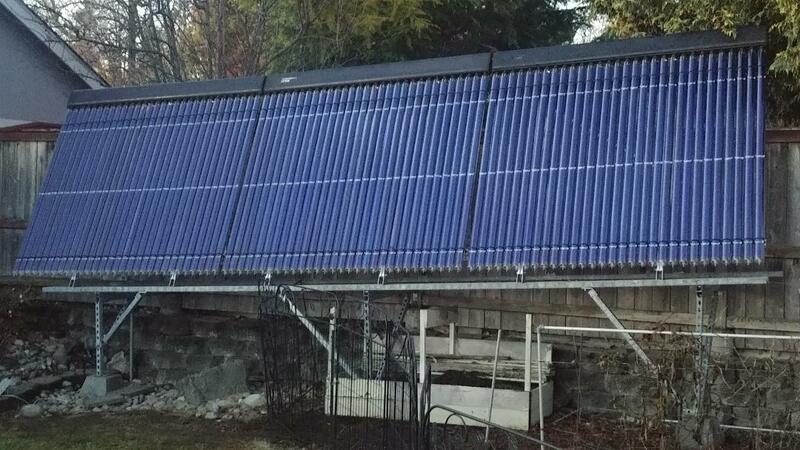 In the last few weeks, I was given a $70,000 solar collection system. The unit was installed at a brewery and used to heat up a lot of water for making beer. 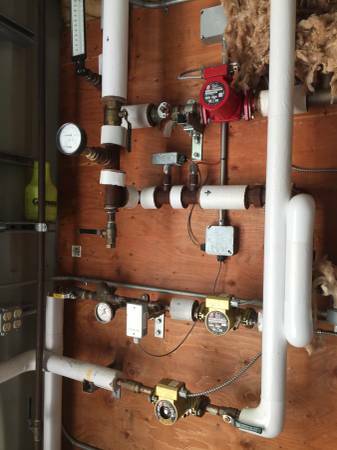 Included in the system is a high efficiency water heater, 2 large (375 gallon each) insulated water storage tanks, 180 evacuated tubes, electronic controls, pumps and plumbing. The business went bankrupt and the new owners wanted it removed. On standby I already have 2 new geothermal heat pumps (1.5 ton) and a used 3 or 4 ton geothermal unit, 6 - 210' 1 1/4" geothermal pipes with ubend's installed at the bottom, drilling rig, fusion tool, purge pump, hydronic aluminum spreader plates for heated floors, pex tubing, 80 gallon heat pump water heater, 80 gallon solar water heater. With the new addition of collectors, I am ready to make a plan to design the system for our house. 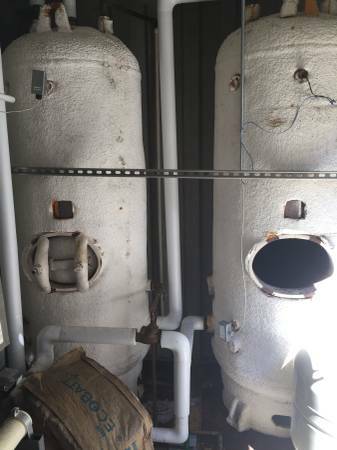 Maybe I don't need a $20,000+ high efficiency water heater and both storage tanks or the extra solar hot water tank, so that is where I need help. Suggestions from friends are to do a Drake's Landing system. Use the hot water to heat the house, floors, hot tub, dhw. I plan on drilling 80' and dropping a loop to test for heat storage or loss of heat every 5 to 10 feet. This way I can see if there a aquifer. Thoughts? 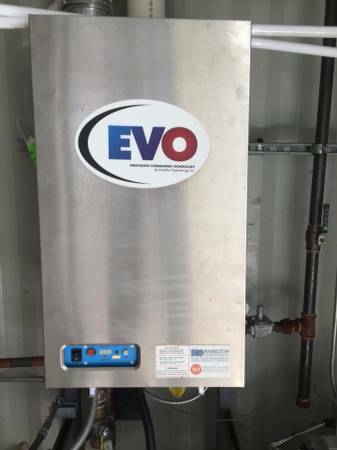 Is the high efficiency natural gas water heater needed? Are the storage tanks needed? Why and why not? I have room for them and it would be at the lower level of my property up against my house. I'm thinking of a drain back system for the collectors. House is 1725 sq. ft. two story, 4 bedroom house with only two adults, kids are out of college and out of the house. Attic insulation was improved last year by a massive amount. Most exterior walls are 2x4. Windows are Milgard vinyl and not of high quality and could use upgrade. Mild climate in the Seattle area. Currently have a 3 ton heat pump with a gas backup furnace. Lower floors will be heated with pex pipe and aluminum spreader plates, backed up with 4" insulated panels. Upper floor is bedrooms and lower temperatures are desired. However, the pex pipe can be installed in most of the rooms. One idea was to use one of the small geothermal heat pumps for the heating season and the other for the cooling season. I would install the ground loops in separate areas of the property as to not affect the other. ... Suggestions from friends are to do a Drake's Landing system. Use the hot water to heat the house, floors, hot tub, dhw. Suggestions from friends are to do a Drake's Landing system. It takes a village to do a Drake's Landing system. You planning on building a village? This way I can see if there a aquifer. How big a village? Two or three homes might work, depending on the size of the system. An aquifer could be used for heating but the water wouldn't be warm enough (even here in Florida) to be used directly, you'd need a heat pump. There was an idea in Texas maybe 50 years ago to use an underground reservoir (probably a salt dome) to use water for cooling during the summer (in the process heating the water) and then using that water for heating in the winter. I don't know if solar even came into it. The idea died, though. This is only for our home and not the neighborhood. It would be nice for someone to hold my hand and say you need to do this and this. Of course that is not going to happen. I am disabled and on a very tight budget. Mostly everything that I get is either free or bought from something I sold that I got for free. I also utilize family and friends to complete projects that could probably be done by one man. It has taken a few years to collect all of the equipment to start a project like this. It would probably take a few years to install it also. This is why I am here asking for help. Maybe this is the wrong place to post for serious questions but I don't have a bank account where I can just pay for an engineer to design the dream system. I truly appreciate the help. Please explain why you suggest and why if you would be so kind? The Drakes Landing example is for 52 homes. But I think it is a sound design and could be used on a smaller scale like our home. The BTES (Borehole Energy Thermal Storage) in the Drake Landing Solar Community (DLSC) consists of 144 boreholes, each stretching to a depth of 121 feet (37 meters) and planned in a grid with 7 feet (2.25 meters) between them. The BTES field covers 115 feet (35 meters) in diameter. I don't have 115 feet but rather like 15 to 20. At the surface, the U-pipes are joined together in groups of six that radiate from the center to the outer edge, and then connect back to the Energy Centre building. The entire BTES field is then covered in a layer of insulation and then soil – with a landscaped park built on top. I don't have or need this much area of coarse. 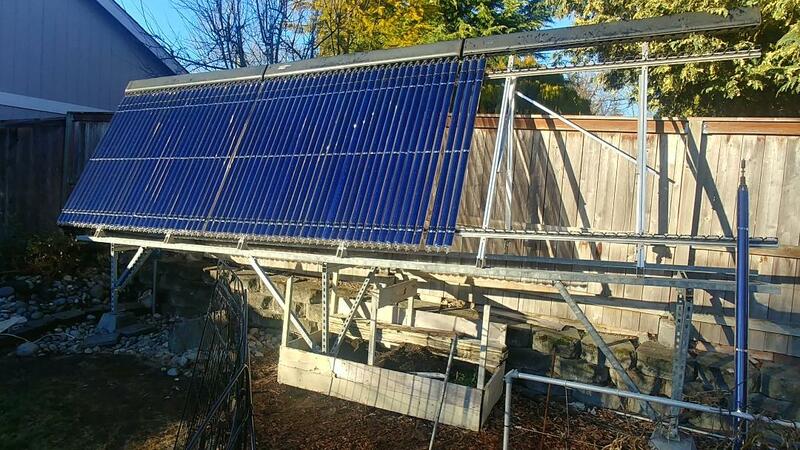 When solar heated water is available to be stored, it is pumped into the centre of the BTES field and through the U-pipe series. Heat is transferred to the surrounding soil and rock, and the water gradually cools as it reaches the outer edge and returns to the Energy Centre. Conversely, when the homes require heat, cooler water is pumped into the edges of the BTES field and as the water flows to the centre it picks up heat. The heated water passes to the short-term storage tank in the Energy Centre and is then circulated to the homes through the district heating loop. All pumps and control valves are housed in the neighbouring Energy Centre building. My soil conditions are mainly glacier rock, sand, clay. It ranges from small pea size gravel to bread loaf sizes and bigger. Well logs in my area show that the water layer is around 80 to 120 feet. We drilled 36 feet with a toy drill and used a 4" bit. It was miserable and shook the machine apart. The new drill machine is diesel operated and has a hydraulic pump. It will be much better at going deeper and faster. We should probably drill another borehole and get the information needed to determine what the water layer is in our area. If we put the borehole into the water layer and pump heated water there, most likely the water will carry the heat away. Good for a geothermal heat pump, but not so good for storing heat. I'm wondering if the BTES system would even work on a small scale, or if the costs and losses would be too great to be economically practical. But, to be honest, I don't know. If there is anyone on here familiar with the system I'm sure they'll step in. Good luck with with it! I'm an HVAC/refrigeration tech from Alberta Canada. My girlfriend lives in Comox BC. Comox is on Vancouver Island perhaps 250-300 miles North of Seattle. My primary home is very close to Drake's landing but I spend a lot of time on the coast. 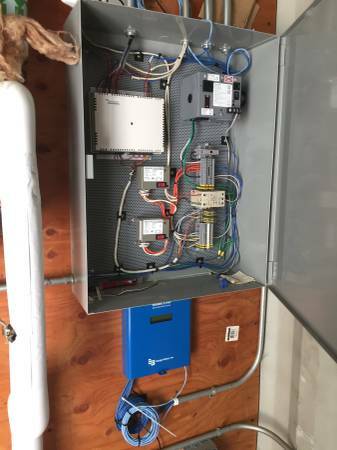 As an HVAC tech when I started reading the original post I was thinking I was listening to a Seattle programmer/millionaire who had lots of money and wanted to try something unique. Drake's landing heating system costed millions of dollars and saves the residents about $25 a month per unit from what I understand. There is value there in the long run but the primary value in the project was for marketing the properties to people who wanted to do something for the planet but didn't know how to do it themselves. They got to buy a piece of a project that did something to help. If I am seeing the pictures correctly and reading the description correctly you are getting six sets of 30 vacuum tubes as part of the $70,000 free solar system. They interest me quite a bit, the rest a little less. If I got my hands on those materials, this is the system I would put in for my girlfriend's house in Comox. I would build a "heat box." I would likely dig 3 feet in the ground and come 3 feet out of the ground (six feet high) and 21 feet square. I would make it 21 feet square and insulate all six sides of the box with 4" of EPS foam. I would use the heat from the solar tubes to heat the box of heat. I would build the box of heat near my condensing unit for the heat pump for the house. I would create a removable insulated shed that I would put over the condensing unit and run some air lines through the heat box. Looking at Seattle's seasonal weather and from my own experience in Comox I would put the shed over the condensing unit from October first to May first and then remove it for the summer air conditioning season. I would run air tubes (6-10" round say) through the box of heat and use a fan to blow air from the box to create a warm envelope around the heat pump for the winter. Heat pumps work great when the outside air is above 50F. They don't work so well with air under 50 F. Create an environment that keeps the air supplying the heat pump above 50F. That's the only critical challenge. Ground source heated water in Canada rarely gets above 50 F. It doesn't work nearly as well as people hope. I'm sure Seattle ground temps will be similar. Unless you are insulating and keeping the moisture out of where you are pumping the heat, the massive volume of ground water will bleed away every BTU of heat you pump into the ground. Use the heat from your tubes to create heat stored well above 50F instead and the cost will be considerably lower as well. Run a loop of copper line from your cold water through the heat box on the way to your present hot water tank and it will cut back hot water heating costs 90% or perhaps better. I actually think the box of heat would rarely get below 100F. I used the sizes for the heat box I did because I know soil weights in cubic yards. That box would contain roughly 150 tons of soil and would give you 30 million btu's of storage over the summer that would equate to the heat for your three coldest months (rough numbers). For us we would build a greenhouse on the heat box to take advantage of heat that was escaping in the winter. I like your idea and the thought that I was a programmer/millionaire. Surely a lot of my ideas are with a millionaire's income, but a beggar's budget! I have in my possession all of the system pictured at my home and you are right about the six sets of 30 for a total of 180 vacuum tubes. Although 4 were damaged. Ground temps here are also in the 50* range. Are you suggesting that the heat produced from the evacuated tubes heat the soil 3' depth under ground level, then 6 foot above ground and 21ft square? I don't have that much above ground real estate. No, the heat battery would need to be six feet deep in total so 3 above ground and 3 below would be great and roughly 400 square feet above ground. A green house on top would need a few steps to get into it. The number I was looking for was roughly 100 cubic yards of soil (7x7x2). With gravelly soil it will weigh roughly a ton and a half per cubic yard. That is about 150 tons of soil. Soil stores heat at roughly half what water does so 150 x 2000lb x 100 degree F temp rise /2 gives you 15,000,000 btu in storage. 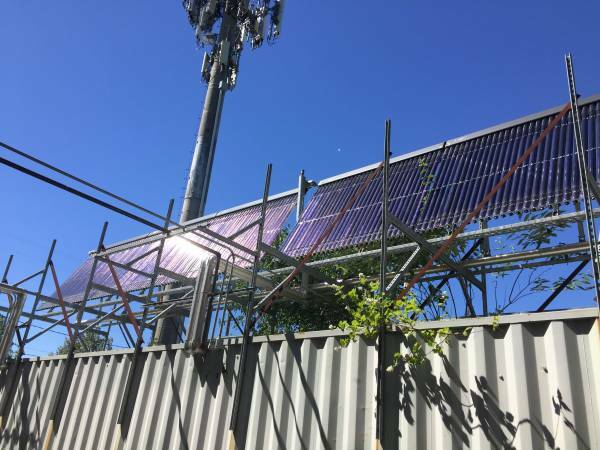 That will cover the bulk of your use in Jan and Feb and the solar gain from your panels through the winter should give you more than enough to break even with the rest of your usage. A smaller heat storage would help dramatically as well but for a smaller season. If you only went after two months - say Dec 1 to Feb 1 you could likely get by with half as big of a battery. Say a six foot deep earth battery / deck along one side of your house that was six feet out from the house and 30 feet long would give you half the storage. Come out 9 feet from the house you are at 75% of the same size. 40 x 10 x 6 deep would give you the same storage as the 20 x 20. In that scenario if you ran a layer of poly from the outside of the earth battery/deck to the eave it would give you either a greenhouse or sun room that would reduce your heating demand a bunch (one warm wall on the house) as well (maybe 15-20%). It would also give you some bright space to get semi outside in the dreary NW coast winters. Half the storage would cover January and February where your heat pump loses it's efficiency most dramatically. The only place where you really gain is when your average outside temp is below 50F. That's where you really want your storage to kick in. So it's been over a year since I touched the evacuated tubes. They sat on the side of my house waiting for a day to get put up. Lately I thought that they will probably sit there for another year until I had some family and friends come over and help start my project. 3 sections were put up and 90 tubes later, you see what is in the pictures. That is as far as it is today. The tubes were stored standing laying down for six months and then standing up after that and was probably not the smartest thing to do. I replaced at least 8 tubes so far that had broken at the bottom where the soft rubber plug is at. I am not sure if washing them with soap and water before they went up in the rack started it. The next morning it was in the lower 30*F range. Most of the 8 tubes broke when the sun began to warm them up. I noticed condensation in where the rubber plug on the bottom of the tube, so I took them all off, washed them in the dishwasher, dried and then replaced them. Didn't lose any more after that. 1. Drainback desired. Not positive it is recommended with these Thermomax HP200 evacuated tube manifolds but the big slope was placed on this setup for that purpose. I sent emails and phone calls to the manufacturer, but they haven't responded in over two weeks. The US and Canada offices are not open anymore I think. So I sent emails to the office in Ireland and just waiting back from them. 2. Where to place the drainback tank? Which tank to use? Free 30 gallon hot water tank, or the Rheem Solaraide 80 gallon purpose built solar water heater? The evacuated tubes and racks are about 20' from the foundation of the house. The outlet or heated line coming out of the manifold is 10' off the ground. About the only two places that I can think of is at the end of the evacuated tubes meaning that the tank will be outside or under the crawl space where it is lower than the ground where the supply and return lines will cross before it goes into the crawl space. The latter would mean that I would have to use the 30 gallon tank. 3. Heat the crawl space for now. The floors are cold in the first floor. This would be a huge win. Right now (December 5th, 2018) the sun hits the panels at 9:30am and is done around 3:15pm. Today I measured 330*F coming out of the end open to the air. Of coarse running water through it will change that. Some of the items I have on hand are.....Rheem 80 gallon Solaraide water heater for the drainback, 30 gallon plain water heater tank, two 375 gallon insulated storage tanks. I don't think the big tanks will be used for a while for this project. It would take a lot of family and friends to move them. They are heavy and big. I have several tube heat exchangers, flat plate heat exchangers and a couple of radiator style in my stash. The geothermal plan is on hold. For right now, but if we could bring the heat generated from the evacuated tubes into the house, then maybe next summer we can do the next phase. I was just now dreaming of just piping the hot air coming out of the evacuated tube manifold into the crawl space with a little solar fan of some kind. But air surely is not as efficient as water in this case, right? 3/4" pipe with a little mini fan inside.